Google has been selling its Assistant hardware, Google Home, in the US since November 2016. But can Google still catch up to Amazon, which has already gathered plenty of experience with Alexa? How mature is Google Home in comparison? A one-week review gave me a mixed impression. Google Home can be bought directly from Google or from various other retailers, including Best Buy, eBay, Target and more for around $129 dollars. The top part of every Google Home cylinder is made of white plastic. The lower, bulging base is available in several colors or in fabric or metal, and it can be removed. Doing so reveals three loudspeakers and a MicroUSB port for debugging. Two wide-angle microphones on top listen to your commands after calling “Okay Google”. In between is a ring consisting of RGB LEDs, and the area is also touch-sensitive. You can pause music or change the volume of Google Home. The button to mute the microphone is located on the back, which is also where the power cable protrudes from the bottom edge. Unlike Google Wi-Fi, this is not a Type-C, but rather a round power plug, such as the ones we recognize from laptops. Since I only recently demonstrated in a review that the Hue lamps can be controlled with Google Assistant, I was able to quickly use this configuration with Google Home, and it wasn’t necessary to re-install Philips Hue for Google Home. Our Google Home setup consists of Google Home, two Cast-ready Raumfeld Cube speakers, a Chromecast, and the included trio of Philips Hue lights. We linked all these smart home components to the same Google account and connected them to the same router. Google Home is still in its preliminary stages. The Assistant itself—the AI-trained voice recognition in the Google Home device, in smartphones, and in smartwatches with Android Wear 2.0—still feels like an incomplete product. It’s only improving gradually, but it’s unfortunately still miles away from being truly amazing. Why? Because the voice assistant’s range of actions is still terribly limited. So, what can Google Home do anyway? How long will it take me to get to work today? What’s on the news? How’s the weather today? Google Home explains it all in a single go, and that is currently the most useful of all its functions. Simply ask “what’s scheduled for today?” and Google Home will start blabbering away about it. You can stream music from various providers; I used Deezer with the review device. The signal can be transmitted to all Cast-ready devices that are connected to the same Google account and are on the same Wi-Fi network. Google Home detects the devices according to the name you give them. They can also be grouped, which is useful for cases where you want to fill several rooms with sound at once. Videos can be played on Cast-ready screens; if need be, you can use the Chromecast HDMI stick or its 4K variant, the Chromecast Ultra. Streams are automatically sourced from YouTube or, in the case of this review device, from Netflix; Google automatically detects the right provider for your search term. However, developers need to provide their apps with an interface so that Assistant can search through them. This is often not the case, and as a result, Google Home does not always know where to find something. Then you have to grab your smartphone again and manually send the stream to the Chromecast from there. Our current smart home review is still somewhat limited. Market leader Philips has been able to connect to the Assistant from day one. If you had already configured it before buying Google Home, it will immediately use this configuration. 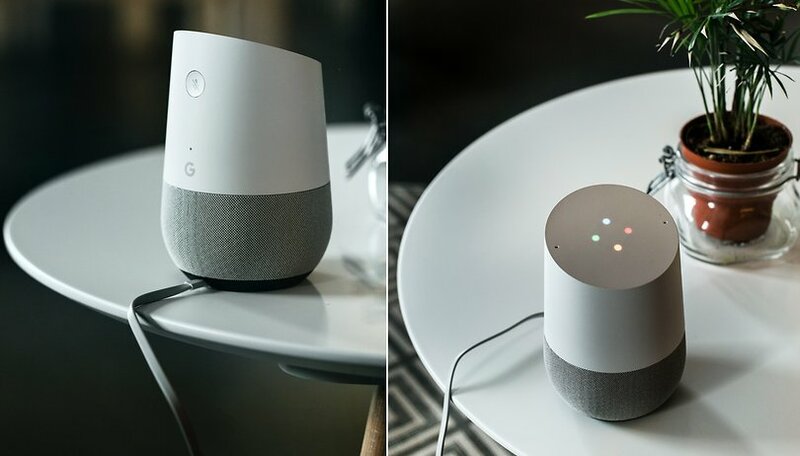 Other Assistant devices such as Android smartphones or Android Wear 2 watches connect to each other—including to Google Home—via your Google account. In the case of the Philips Hue, the integration works somewhat differently than with Amazon Alexa. I had already explained the differences in detail when I connected the smart bulbs to the Assistant in the Huawei Watch 2. The famous lighting recipes from the Hue app cannot be retrieved from the Assistant; on the other hand, Amazon Alexa can pull this off without a hitch. However, the advantage of the Google method is that your Ikea, Osram and Philips lamps can be collectively sorted into rooms and centrally controlled, thereby solving the problem of different standards. Thermostats or smart power outlets can also be controlled via voice. You can use your Google Assistant to link accounts from dozens of smart home manufacturers, rename devices, and assign rooms. In addition, Google Home has recently been able to link IFTTT commands, which allow complex program flows that are started depending on certain triggers, to be known. These triggers are in turn known to Google Home by name, allowing it to start them on command. You can abbreviate or create fun shortcuts for exceptionally long commands. The number of search commands is constantly growing. They are currently the same ones, like the “Okay Google” requests that we know from voice searches. Famous people’s birthdays, weather, math problems and word definitions are no problem. You can even create shopping lists or set the alarm or timer. To increase the list of commands, which is still quite short, app developers need to jump on the Google AI bandwagon. However, the actions interface used for this is apparently still uncharted territory for quite a number of app developers. On the other hand, Alexa’s counterpart, Skills, is already seeing repeated use, and it even makes the significantly cheaper Echo Dot a versatile assistant in day-to-day life, for now. Google can differentiate between the voices in your family. If junior adds something to his shopping list, dad cannot readily retrieve it. Each user has their own bundle of news sources, their own calendar and their own list, which they can freely edit. As a result, up to six accounts can be linked to Google Home, whose users will each have completely different experiences with the device. We will do a more extensive review of Google Home’s multi-user feature in the future. Google has put together a few audio games that are mainly suitable for children. Quizzes with animal noises or family-friendly jokes are already included, but you won’t find a new chess opponent here yet. Similar to the Amazon Echo, you can view a history of recently-inputted voice commands. You can also delete these commands from your overview, but this won’t erase them from Google’s servers. They are merely removed from your account. Its high-excursion loudspeaker with 2-inch drivers and dual 2-inch passive radiators beam sound in all directions. Its acoustics are not bad, but certainly not Hi-Fi. Since the loudspeaker does not have a headphone jack, you cannot connect it to your stereo, but at least Google Home supports Bluetooth after the last software update. However, the most recommended method is the Cast function. The hands-free function works via the far-field microphone, and an additional button on the rear lets you deactivate voice recognition. For all intents and purposes, Google Home is pretty much a year old and needs to do more. In the U.S., the smart voice box has already been on the market long enough to give app developers time to implement the actions, but so far, the added value is limited to few areas. Google Home is most likely worthwhile for those of you who finally want to control Google Cast-ready devices by voice. However, this review of Google Home is still ongoing, since the artificial intelligence behind it learns something new every day. Nevertheless, I can give a preliminary opinion. Google Home is a very promising implementation of a day-to-day AI assistant that currently doesn’t deliver all that much right now, but it’s not just Google that’s at fault for this. The problem lies in a lack of apps that respond to voice control. However, when you look at its competitor Amazon and its considerable number of Alexa skills, it’s apparent that there is growing interest in the market. And since Google will install the Assistant on more hardware, perhaps including vehicles as well, it will also continue its development there, and this development can then prove useful with Google Home as well. Until then, the loudspeaker unfortunately comes off as somewhat dumb. You cannot review Google Home without reviewing Google Assistant, too. It currently has its hands tied but, in the long term, it will become significantly more useful. programme: A town called Eureka! Great but need to add more informatic and detail, thanks. I think Google Home's potential is still largely untapped, as it's still early days for smart home tech. We hope to bring out more stuff about it soon. Wow. Doesn't do scenes? You can say hey Google change living room lights to mauve. You can't change color with Alexa. You can setup automatic scenes and more using built in compatibility with ifttt ..... the basic power to control hue with voice is vastly superior with home compared to Alexa. Just tell it to do anything with the lights and it is done. Hue scenes don't matter in this case and are actually restrictive. As someone who has tried both Echo and Google home I can say without a doubt that the two are nearly identical in terms of what can be done with smart lights. I actually have the ability to control color, brightness, scenes, and temperature of my bulbs on my echo dots. Google can't do temperature or scenes. I don't use name brand bulbs either and to me that makes the functionality more impressive on amazons part. The echo devices are very well done and tough to beat. I love Google don't get me wrong but dissing echo without proper testing is just ignorant.